Alcalá de Henares , meaning Citadel on the river Henares, is a Spanish city whose historical centre is one of UNESCO’s World Heritage Sites, and one of the first bishoprics founded in Spain. Located in the Autonomous Community of Madrid, 35 km northeast of the city of Madrid, at an altitude of 588 m (1,929 ft) above sea level, it has a population of around 200,000, the second largest of the region after the Spanish capital itself. The city is generally known simply as “Alcalá”, but “de Henares” is often appended to differentiate it from a dozen cities sharing the name Alcalá (from the Arabic word al-qal’a القلعة for fortification or citadel). The Latin name, Complutum, is sometimes used. 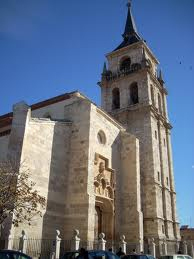 The city is capital of its namesake region, Comarca de Alcalá. The old city centre has been largely preserved, unlike the suburbs. There has been no clear planning by the city councillors regarding expansion, and the sprawling suburban areas are irregularly constructed, with the addition of 1970s-style high rise blocks in many places. One of the most important streets in the city is the Calle del Cardenal Cisneros which takes tourists from the Madrid Gate at the entrance of the city, to the old city center and the Cathedral in Santos Niños Square. The main park of Alcalá, Parque Municipal O’Donnell is a major recreational center for city residents and lies along a main road of Alcalá, Vía Complutense. The city hosts a large population of international students due to the presence of the University, and in particular its Spanish language and literature programs for foreign students. Alcalingua, a branch of University of Alcalá, is one of the major foreign language learning centers for students from abroad. Alcalá is well known for its population of white storks. Their large nests can be observed atop many of the churches and historic buildings in the city, and are themselves a significant tourist attraction. Situated in the lowlands of the Henares river, the city is an attractive home for the migratory storks due to the wide availability of food and nesting material in the area. For over twenty years Alcalá’s storks have been counted and studied, and the active protection and maintenance of their nests is by official policy. Although once in danger of disappearing, with only eleven pairs counted between 1986 and 1987, the population has grown to around 90 resident pairs today, many of which have shortened the distance and duration of their typical migrations to remain in the city nearly all year. The climate in this city of central Spain is the continentalised Mediterranean, with cold, dry winters and hot, dry summers. Rains fall mainly in spring and autumn. Temperatures vary from some degrees below 0 °C (32 °F) in December and January to some over 40 °C (104 °F) in July and August. The city boundaries have been inhabited since the Calcolithic phase of the Bronze Age. Romans conquered the area in the 1st century BC, and built the town of Complutum near a previous Celtiberian settlement, called Iplacea. Thus, it became the only Roman town in the Madrid region. With 10,000 inhabitants, it reached the status of Municipium and had its own governing institutions. After the falling apart of the Roman Empire, under the Visigoths, it declined, although it also became a pilgrimage place for the Saints Justo and Pastor. When in 711 the Moors arrived, they subdued the Visigothic city and founded another site, building an al-qal’a, which means “citadel” in Arabic, on a nearby hill, today known as Alcalá la Vieja (Old Alcalá). On 3 May 1118 it was reconquered by the Archbishop of Toledo Bernard de Sedirac in the name of Castile. The Christians preferred the Burgo de Santiuste (“Saint Just’s borough”) on the original Roman site and the Arab one was abandoned. The city was ceded to the Bishopric of Toledo, which granted it ferial rights. Under Christian rule until the end of the Reconquista, the city sported both a Jewish and a Moorish quarter and had a renowned marketplace. Its central position allowed it to be a frequent residence of the Kings of Castile, when travelling south. At some time in the 1480s Christopher Columbus had his first meeting at the “Casa de la Entrevista” with the Reyes Católicos, Ferdinand and Isabella, who financed the travel for the Discovery of America. The city suffered severe damage during the Spanish Civil War. The author Miguel de Cervantes was born in Alcalá de Henares, and baptized in the Church of Santa María in 1547, although his family moved from the city when he was still young. The city celebrates his birthday, 9 October, every year and organizes an annual Cervantes festival. The local university is acknowledged as a global leader in the study of Cervantes and his works. In 414 a chapel was erected at the site of Justus and Pastor’s martyrdom, and was converted into a Cathedral during the period of Visigoth control of Hispania; bishops from Alcalá were present at the Councils of Toledo beginning in the 7th century. In 1053 the old city of Alcalá (Alcalá la Vieja) was conquered by Ferdinand the Great, only to be recaptured the following year by the Moorish armies then warring for control of the Iberian Peninsula, who destroyed the cathedral as an act of retaliation. At that time the relics of Saints Justus and Pastor were taken to Huesca for safekeeping until after the reconquest of Alcalá in 1118. Although a church was rebuilt on the site in 1122, Pope Urban II, under the influence of his friend Raymond de Sauvetât, the Archbishop of Toledo, decided not to restore the Diocese of Alcalá at that time. Instead, de Sauvetât was able to secure the incorporation of Alcalá into his own archiepiscopal territories through a donation from King Alfonso VII in 1129. Other notable figures associated with the city are Ferdinand I of Aragon, cardinal Francisco Jiménez de Cisneros, the mystic John of the Cross, the theologian Gabriel Vázquez, the poet Juan Ruiz, Arcipreste de Hita, and Manuel Azaña Díaz, writer and politician, who was President of the Second Spanish Republic between 1933 and 1936. Ignatius of Loyola was once a student at the university, yet after several run ins with the Spanish Inquisition, he left the city. Alcalá hosts an annual “Noche en Blanco.” During this festival the streets are filled with music, art, theatre, and dance as the city residents celebrate Alcalá’s rich cultural heritage. The festival goes well into the night and centers around the Plaza de Cervantes where stages are set up to host the performances. The town of historic importance was one of the first bishoprics founded in Spain. The polyglot Bible known as the Complutensian Polyglot Bible, the first of the many similar Bibles produced during the revival of Biblical studies that took place in the 16th century, was printed at Alcalá under the care of Cardinal Cisneros. A Papal Bull of 7 March 1885, united Alcalá with (effectively merging it into) the diocese of Madrid which includes the civil province of Madrid, suffragan of the archbishopric of Toledo, which was formally speaking not canonically erected before while its foundation dated from the Spanish Concordat of 1851. The bishop’s residence has since been used for preserving historical archives. It was designed by Alonso Berruguete and has a famous staircase. The major landmark and greatest pride of the city, its university, is spread throughout the city, but generally exists in two campuses. The first is on the north side of Alcalá. This campus includes most science departments and student housing (as well as its own, separate RENFE station). The second, central campus, houses most of the humanity and social science departments, including a law school. The architectural influence of the university can be found in other present-day academic institutions. The University of San Diego is largely based on the Spanish University; its campus and address take the name “Alcalá Park.” In addition, some buildings at Texas Tech University in Lubbock, Texas, were modeled after the architecture of Universidad de Alcalá de Henares. The Universidad Complutense, one of the oldest universities in the world, was founded by King Sancho IV of Castile as Studium Generale in 1293 in Alcalá de Henares. With the patronage of Cardinal Cisneros, it was granted Papal Bull in 1499, and quickly gained international fame as a main centre of learning of the Renaissance thanks to the production of the Complutensian Polyglot Bible in 1517, which is the basis for most of the current translations. The University moved to Madrid in 1836 by Royal Decree (initially as the Universidad de Madrid, later as the Universidad Central, which in the 1970s would finally be renamed Universidad Complutense de Madrid). A new university was founded in the old buildings as the Universidad de Alcalá in 1977. Parts of the new University occupy the buildings of the old Universidad Complutense in the city centre, including the modern Colegio de San Ildefonso, and other Colegios, and the structures have served as a model for other universities across the Spanish territories in the Americas and other dependencies. The university chapel dedicated to Saint Ildefonso has a monument to the University’s founder, Cardinal Cisneros, by Fancelli, an Italian sculptor. It should be noted that while the present university is named “Universidad de Alcalá”, the ancient institution founded by Cisneros is the one now called “Universidad Complutense” located in the capital city of Madrid (“Complutensis” is the Latin word for “native of Alcalá”). The modern University is related to the original institution in name only, although it occupies the former buildings of the Complutense. Aside from the buildings associated with the University, the city’s most important and historic buildingis the Cathedral-Magistral of Saints Justus and Pastor, known formally in Spanish as the “Santa e Insigne Catedral-Magistral de los Santos Justo y Pastor” or more familiarly as the “Catedral de los Santos Niños.” Constructed between 1497 and 1514, the Cathedral houses the remains of Saints Justus and Pastor, two Christian schoolboys martyred near the city during the persecutions of the Roman Emperor Diocletian at the beginning of the 4th century. The western façade of the Cathedral of the Santos Niños, illustrating a “florid” or “Isabelline Gothic” style. The church was rebuilt again some three hundred years later by a subsequent Archbishop of Toledo, Alfonso Carrillo de Acuña, who elevated it to the status of a collegiate church. It was finally reconstructed in its present Isabelline Gothic style under Cardinal Cisneros (1495–1517), the founder of the University. A tower was added between 1528 and 1582, achieving its modern appearance in 1618. The processional cloister and the Chapel of Saint Peter were incorporated into the building in the 17th century. The building was declared a national monument in 1904. Nevertheless, it was burned during the Spanish Civil War (1936–1939) and practically all of its contents were destroyed with the exception of a few minor relics and choir seats. The Cathedral of Alcalá is notable as one of only two churches in the world to be granted the special title “Magistral” (along with St. Peter’s Church in Leuven, Belgium). The title reflects its former status as a Collegiate Church, and derives from the requirement that all of the canons of the Cathedral must possess the academic distinction of Doctor of Theology in order to serve there. In addition to that of Saints Justus and Pastor, the Cathedral also houses the tomb of renowned 17th-century Spanish sculptor Gregorio Fernández. The city is also home to the Archbishops Palace. This site is where Christopher Columbus and King Ferdinand planned the excursion to the West as well as the birthplace of Catherine of Aragon, daughter of Ferdinand and Isabella, who would be the first wife of King Henry VIII of England and therefore Queen consort of England. Alcalá’s Corral of Comedies, which hosts a full program of theatre and is open for tours, is the oldest documented corral in the history of Spain. Some 18% of the population are of foreign origin, according to the official data, a large part of the newcomers (30%) are immigrants from Eastern Europe. Many Chinese businesses have also been established in the city. Alcalá has the largest community (18%) of Romanian immigrants in Spain, with over 35.000 people. In 2007, for the first time, the immigrants from Romania created a political party for the elections to come. There is also a festival once a year, celebrated at the city central square (Plaza de Cervantes) dedicated to the people of Romania in Alcalá. 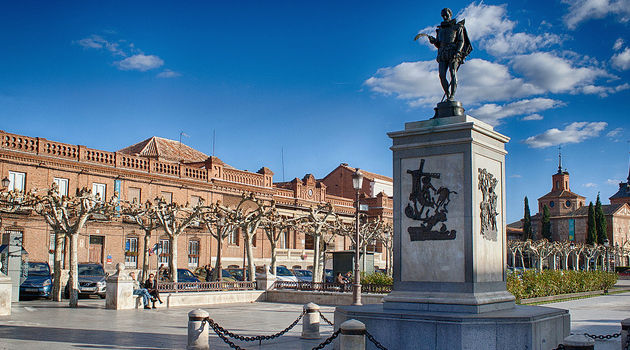 Alcalá’s excellent transport links with Madrid have led to its becoming a commuter town, with many of its inhabitants travelling to work in the capital. It was affected particularly badly by the 11 March 2004 Madrid train bombings in Madrid as all the bombs were placed on trains that originated in, or passed through, Alcalá. There is now a memorial placed at the entrance to the station in remembrance of the victims. Alcalá also has an intensive bus system called “Alcalá-Bus” which runs to all the major neighborhoods and costs 1,30 euro per ride.